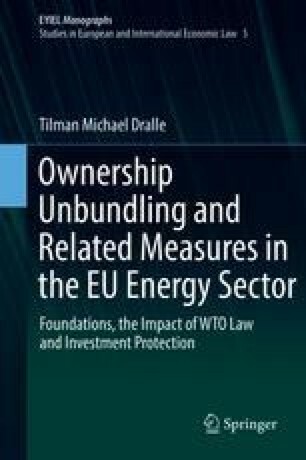 The objective of this book has been to examine how WTO law and international investment law interact with the unbundling and unbundling-related measures in the EU energy sector introduced through the Third Energy Package in 2009. Following the provision of the necessary background information (Chaps. 2 and 3), the analysis was divided into two main parts. First, it was analyzed whether, and if so to what extent, WTO law and international investment law set limits on the adoption and maintenance of unbundling and unbundling-related measures (Chaps. 4 and 5). Second, in an effort to change the perspective, it was asked whether WTO law could serve as a vehicle for the implementation of unbundling measures. In other words, it was considered whether general WTO law could be utilized so as to impose certain (rudimentary) unbundling requirements upon the operations of vertically integrated energy undertakings, and whether additional pro-competitive regulatory principles might be needed at the multilateral level (Chap. 6). The relevance of the findings summarized below is not limited to the EU nor to the energy sector, but extend to many other countries around the world that have implemented, or plan to implement, unbundling regimes either in the energy industry or in other network-bound industries, such as railways and telecommunications.